This module allows customers to select and change designs while inside the application. An extra designs tab is created where customers get to select a different design from the same category if they so choose without getting out of the application. This is vital and useful for designs like Business Cards or Phone Cases where they can choose their devices at run-time. 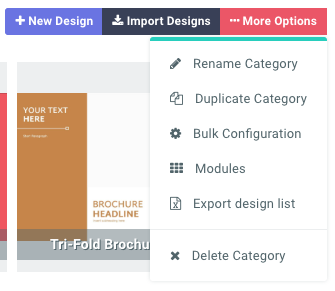 This will launch the category modules panel and you can find the Design Selector Module there. Title: Provide an appropriate title to be displayed on top of the designs panel. Default Design: Your category will have designs displayed alphabetically but you might want to show a particular one first. Here, we set it to load the Nokia Lumia 920 as default. So when the app loads, this is the default design that will be loaded. Use pages as selectable layout: Enabling this means the pages acts as different layouts instead of each being a requirement. Let’s use two examples: In a business card design, you most probably want both pages front and back printed, so this should be disabled. On the other hand, a Phone Case design can have different layouts as separate pages but only one layout is needed by the customer; in this instance, this option should be selected. It means the pages are treated as different designs so to speak and it presents them as layouts instead of presenting the regular page navigation. Use Image thumbnail: Enabling this feature will show the product picture in the design gallery tab. Disabling is will only show the title of the design. 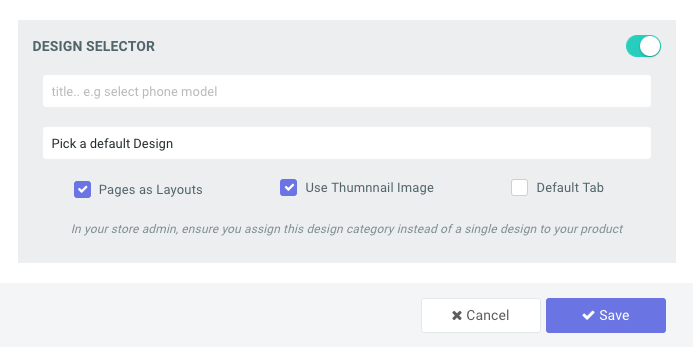 If you have a long list of designs, then is is advisable to use the text option by disabling this feature but if not, you can go ahead and use the image based thumbnails. Submit to save your changes. And the module will override the default behavior of picking a design before launching the application.